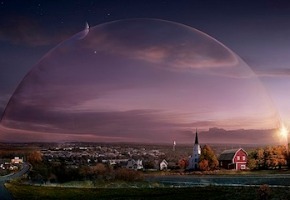 TEN will fasttrack new US sci-fi / horror miniseries Under the Dome to a same-day broadcast in Australia, which is good news. The miniseries based on a Stephen King novel will air 8:30pm Tuesday June 25th. Say goodbye to the outside world. From the undisputed master of suspense, Stephen King and Steven Spielberg comes Under the Dome, a psychological drama about a town trapped under an impenetrable dome. Starring: Rachelle Lefevre, Natalie Martinez, Mike Vogel, Dean Norris, Colin Ford. Personally, I see Tuesday night as the time for it. Wednesday Ten have Offspring. 9.30 is free but I figure that’s too late. Thursday always has been Law Order: SVU, so why change something that works for something that might not. There’s minimal numbers Friday and Saturday, so no point there. Which leaves Sunday. They’ve got a reasonably solid line up (MasterChef, Elementary, Graham Norton, Hawaii Five-0). Ten’s primetime schedule might look pretty ordinary, but I don’t see the 8.30-10.30 slots as the problem. Their problem is earlier (Simpsons is a poor lead in to The Project). This is on Tuesdays @ 8.30. Futurama is on Wednesdays, Star Trek: Deep Space Nine is on Thursdays. How are either of these up against Under the Dome?